Do You Dream of a Restful Night’s Sleep? At Beelman Dental, we want all our patients to be able to live happy, healthy lives so they can live up to their potential and enjoy life – but when your breathing prevents enough oxygen from getting to your brain and you’re not getting any sleep, it can be hard to be your best self. If you or your partner suffers from chronic snoring, the snorer might have sleep apnea. Thankfully, your Bedford dentist has a simple solution that doesn’t require a CPAP machine! Obstructive sleep apnea occurs when the soft tissues in the back of the throat relax and collapse during sleep, blocking the airway and preventing proper breathing. Mixed sleep apnea is a combo of the two. Central and mixed sleep apnea require treatment from a medical professional, sleep specialist or neurologist, but Dr. Beelman can help treat obstructive sleep apnea. There are many factors that can cause and contribute to the development of obstructive sleep apnea. Most obstructive sleep apnea sufferers are men over the age of 40. Women and children can also suffer from sleep apnea, but it is much less common. Physical factors including obesity or having a large neck or narrow airway can increase your risk, as well as drinking alcohol, using sedatives, or eating spicy foods. The most common sign of sleep apnea is chronic snoring. Sleep apnea sufferers often wake themselves up choking or gasping for air multiple times throughout the night. Constant sleep disturbances lead to chronic fatigue and daytime sleepiness, as well as a constant feeling of waking up exhausted even after what should have been a full night’s rest. Many sleep apnea sufferers will wake up with a dry mouth or a headache and will have to urinate more frequently throughout the night. Sleep apnea can also cause insomnia, nightmares, anxiety, and depression. 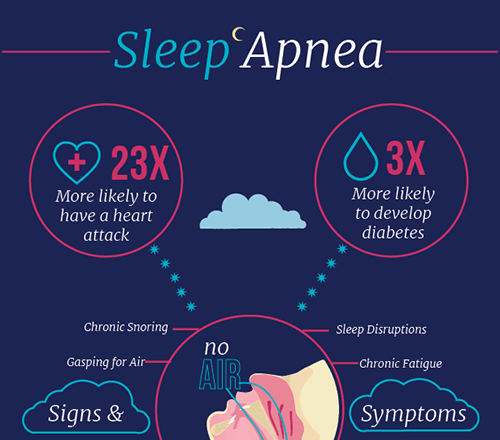 Sleep apnea can have devastating—even deadly—consequences if left untreated. Sleep apnea causes low blood oxygen levels from a lack of oxygen night after night, which contributes to a downward spiral of the immune system and the development of serious systemic diseases. Left untreated, over time sleep apnea can cause serious health problems including heart disease, stroke, and diabetes. Sleep apnea sufferers are also more likely to fall asleep randomly throughout the day and are at a high risk of auto accidents caused by falling asleep at the wheel. What’s the solution for sleep apnea? Traditionally, the “gold standard” for sleep apnea treatment is the CPAP machine. CPAPs are highly effective when used properly, but they are not very user-friendly, so most patients end up abandoning the treatment because it prevents them from finding restful sleep. It can be a vicious cycle! Thankfully, there is an exciting alternative to CPAP—oral appliance therapy. Oral appliance therapy uses a custom oral appliance that’s worn like a mouthguard during sleep. The device is custom-designed and fitted to an individual’s mouth and gently shifts the lower jaw forward a few millimeters. This slight shift prevents the airway of the wearer from collapse, allowing comfortable breathing throughout the night. If any of the above sounds familiar, or you’ve been diagnosed with sleep apnea and have tried a CPAP without success, oral appliance therapy is worth a second look. This simple, non-invasive solution could dramatically change your quality of sleep, your quality of life during the day, and potentially prevent a major health problem—like a heart attack—down the road. If you have any questions about sleep apnea or would like to schedule an appointment with your Bedford dentist, Dr. Beelman at Beelman Dental, give us a call today at (817) 409-3830 or request an appointment online below.